Ring as Symbol of Marriage by Purchase. Finger-rings, like rings for the ears and the nose, were used as ornaments by the Jews as early as the Biblical period (Ex. xxxv. 22, etc. ), while seal-rings (Gen. xxxviii. 18, 25, etc.) and rings as signs of the highest dignity were likewise known at that time (ib. xli. 42, etc.). Neither the Bible nor the Talmud, however, speaks of the ring as symbolic of marriage. 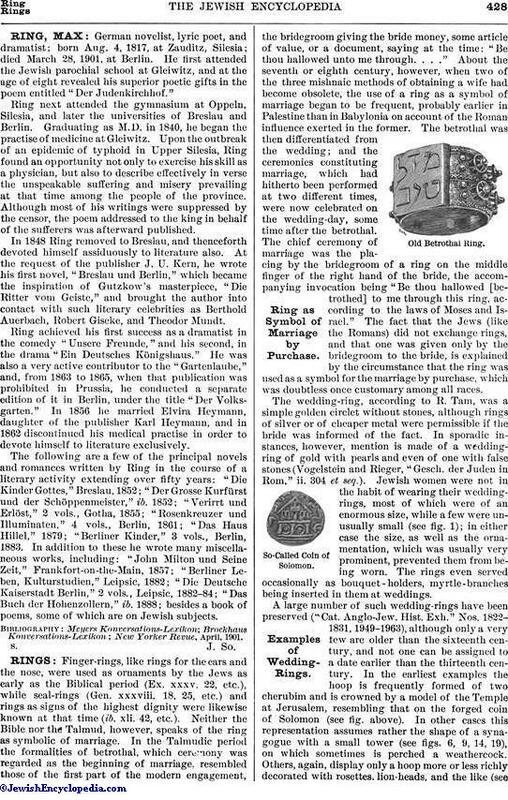 In the Talmudic period the formalities of betrothal, which ceremony was regarded as the beginning of marriage, resembled those of the first part of the modern engagement, the bridegroom giving the bride money, some article of value, or a document, saying at the time: "Be thou hallowed unto me through. . . ." About the seventh or eighth century, however, when two of the three mishnaic methods of obtaining a wife had become obsolete, the use of a ring as a symbol of marriage began to be frequent, probably earlier in Palestine than in Babylonia on account of the Roman influence exerted in the former. The betrothal was then differentiated from the wedding; and the ceremonies constituting marriage, which had hitherto been performed at two different times, were now celebrated on the wedding-day, some time after the betrothal. The chief ceremony of marriage was the placing by the bridegroom of a ring on the middle finger of the right hand of the bride, the accompanying invocation being "Be thou hallowed [betrothed] to me through this ring, according to the laws of Moses and Israel." The fact that the Jews (like the Romans) did not exchange rings, and that one was given only by the bridegroom to the bride, is explained by the circumstance that the ring was used as a symbol for the marriage by purchase, which was doubtless once customary among all races. The wedding-ring, according to R. Tam, was a simple golden circlet without stones, although rings of silver or of cheaper metal were permissible if the bride was informed of the fact. In sporadic instances, however, mention is made of a wedding-ring of gold with pearls and even of one with false stones (Vogelstein and Rieger, "Gesch. der Juden in Rom," ii. 304 et seq.). 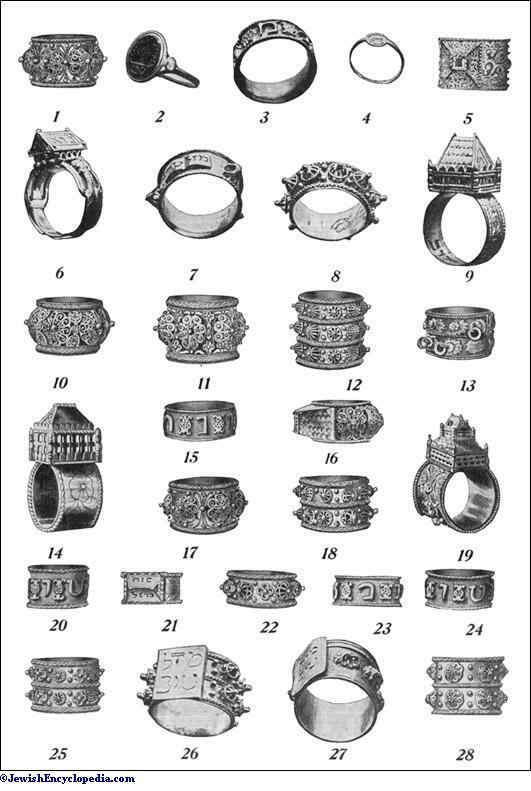 Jewish women were not in the habit of wearing their wedding-rings, most of which were of an enormous size, while a few were unusually small (see fig. 1); in either case the size, as well as the ornamentation, which was usually very prominent, prevented them from being worn. The rings even served occasionally as bouquet-holders, myrtle-branches being inserted in them at weddings. 1, 5, 10-13, 15-18, 20-25, 28, in the Victoria and Albert Museum, London. 2-4, 6-9, 26, 27, in the collection of Albert Wolf, Dresden. 14, from Rücklin, "Schmuckbuch." 19, from Luthmer, "Gold und Silber." A large number of such wedding-rings have been preserved ("Cat. Anglo-Jew. Hist. Exh." Nos. 1822-1831, 1949-1963), although only a very few are older than the sixteenth century, and not one can be assigned to a date earlier than the thirteenth century. In the earliest examples the hoop is frequently formed of two cherubim and is crowned by a model of the Temple at Jerusalem, resembling that on the forged coin of Solomon (see fig. above). In other cases this representation assumes rather the shape of a synagogue with a small tower (see figs. 6, 9, 14, 19), on which sometimes is perched a weathercock. Others, again, display only a hoop more or less richly decorated with rosettes, lion-heads, and the like (see figs. 1, 8, 12, 22), occasionally, however, bearing a small shield at the top. Especially costly specimens show a party-colored enamel decoration. The rings bear; almost without exception, an inscription, either engraved or in relief, around the hoop (see fig. 24), reading (see fig. 6) on the earliest specimens, but on the later ones or , an expression of felicitation which did not come into use until the fifteenth century (Berliner, "Aus dem Leben der Deutschen Juden im Mittelalter," p. 49). 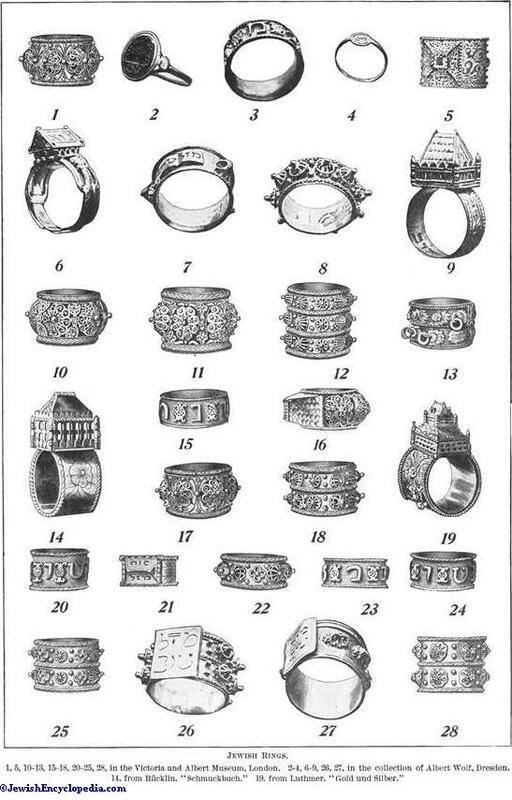 Most of these wedding-rings were made at Venice (Rücklin, "Schmuckbuch") and hence were probably produced by Jews, since, according to Lecky ("Rationalism in Europe," ii. 237, note 2), many of the Venetian goldsmiths who practised the art of carving were of that race. 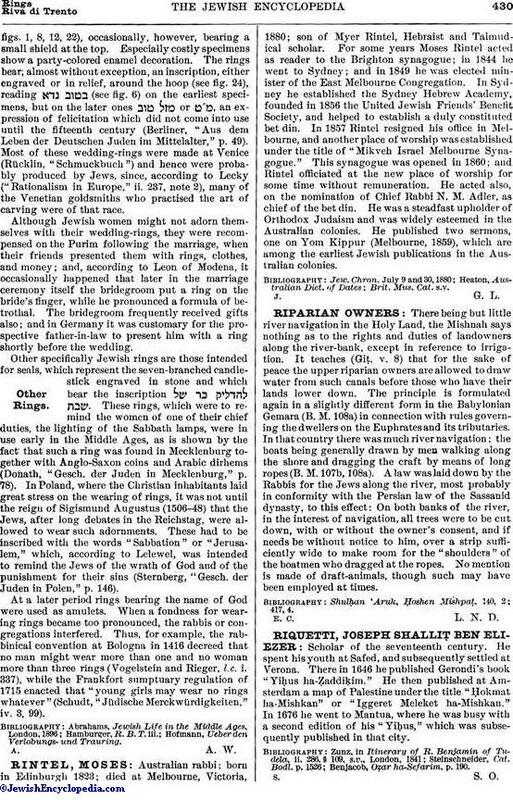 Although Jewish women might not adorn themselves with their wedding-rings, they were recompensed on the Purim following the marriage, when their friends presented them with rings, clothes, and money; and, according to Leon of Modena, it occasionally happened that later in the marriage ceremony itself the bridegroom put a ring on the bride's finger, while he pronounced a formula of betrothal. The bridegroom frequently received gifts also; and in Germany it was customary for the prospective father-in-law to present him with a ring shortly before the wedding. Other specifically Jewish rings are those intended for seals, which represent the seven-branched candle-stick engraved in stone and which bear the inscription . These rings, which were to remind the women of one of their chief duties, the lighting of the Sabbath lamps, were in use early in the Middle Ages, as is shown by the fact that such a ring was found in Mecklenburg together with Anglo-Saxon coins and Arabic dirhems (Donath, "Gesch. der Juden in Mecklenburg," p. 78). In Poland, where the Christian inhabitants laid great stress on the wearing of rings, it was not until the reign of Sigismund Augustus (1506-48) that the Jews, after long debates in the Reichstag, were allowed to wear such adornments. These had to be inscribed with the words "Sabbation" or "Jerusalem," which, according to Lelewel, was intended to remind the Jews of the wrath of God and of the punishment for their sins (Sternberg, "Gesch. der Juden in Polen," p. 146). At a later period rings bearing the name of God were used as amulets. When a fondness for wearing rings became too pronounced, the rabbis or congregations interfered. Thus, for example, the rabbinical convention at Bologna in 1416 decreed that no man might wear more than one and no woman more than three rings (Vogelstein and Rieger, l.c. i. 337), while the Frankfort sumptuary regulation of 1715 enacted that "young girls may wear no rings whatever" (Schudt, "Jüdische Merckwürdigkeiten," iv. 3, 99). Hofmann, Ueber den Verlobungs- und Trauring.